Daily exercises in tonal realism since February 2013; adorned with terrible puns since 2014. Forbidden fruit is the sweetest (although we're perfectly entitled to eat pears, they're sweet nevertheless). Oil on canvas board, 6" x 4"
I'm a Luddite web developer who yearns for the pre-digital past. I make the modern world tolerable by painting, playing musical instruments, walking, reading books and enjoying long breakfasts. If every picture tells a story, then this is a Canterbury tale. 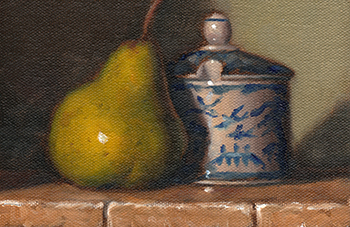 Oil on canvas board, 8" x 10"
Bottles are brown, green is this pear; the green one is fruit, the brown earthenware. Oil on canvas board, 8" x 10"
Wake up and smell the potato. Oil on canvas board, 4" x 6"
Flute quartet Oil on canvas board, 6" x 4"
Ivory much look forward to persimmon season. Oil on canvas board, 6" x 4"
Lemons are lemon, bowls are white; if one ate this painting, would one sate appetite? Oil on canvas board, 10" x 8"
No pepper pun, just sample text. Oil on canvas board, 4" x 6"